We haven't seen anything from UK based manufacturer PC NextDay in almost a year, but the ZooStorm 3389-9209/B is a solid laptop with a strong display. A couple of usability issues are all that hold it back. The flat keyboard is comfortable to type on, thanks to wide palmrests, and includes a separate numeric keypad for data entry. However, the action is a little spongy and the left Ctrl key has swapped places with the Function key, which is annoying when using keyboard shortcuts in Windows. The touchpad has a single bar beneath that acts as the mouse buttons, and we found that resting our thumb on the bar caused the cursor to skip around the screen, much like the HP. Keeping your thumb clear solves the issue in most cases, although selecting blocks of text is a huge pain and simply pushing the buttons occasionally makes the cursor skip too. Three touch-sensitive controls above the keyboard quickly open Internet Explorer, toggle Wi-Fi on and off, and mute the laptop. However, we found the Internet Explorer button was very unresponsive and we only got it to work twice. Despite the usability issues, this is a solid laptop with a screen that tilts back further than any other here. It looks smart with an all-black chassis and is close to the other 15.6-inch laptops in size and weight, making it easy enough to carry around. The battery life of 229 minutes beats all but the HP ProBook 4525s, and will suit the daily commute. The display is also one of the best, producing sharp and vibrant images. Colours are well reproduced, thanks to the glossy Super-TFT coating, but this makes the screen highly reflective, a problem that all except the HP suffer from. Performance is good, with an Intel Core 2 Duo processor providing enough power to run intensive applications, even simultaneously. 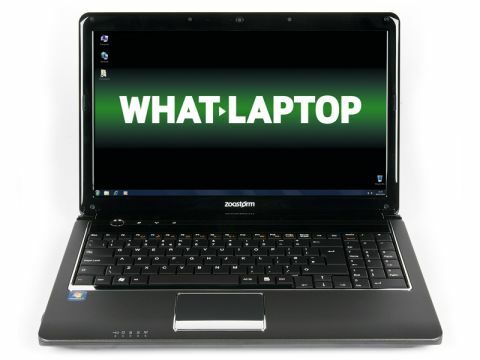 Only the Lenovo IdeaPad Z560 here provides more power. However, the integrated graphics are less capable than the dedicated GPUs found in the HP and Lenovo and are good enough only for the most basic multimedia performance. Plenty of ports are on offer, including an ExpressCard slot for attaching peripherals, a 4-in-1 memory card reader for sharing photos from your digital camera and an eSATA port. However, there's no HDMI port for connecting external HD displays. A 500GB hard drive provides a generous amount of storage for your files and media.